In our latest "Meet the Springers" episode, we catch up with recent ROCORI high school graduate Brian Skluzacek. Brian was an all-state baseball player this past season and is currently in his second season as a member of the Cold Spring Springers. Brian Skluzacek is one of the younger guys but has been a Springer fan for his entire life. We had a chance to catch up with a few of the characters that make Springer baseball so fun. Duane Krueger has been doing the PA for the Springers for quite some time now and loves every minute of it. Also we catch up with a few guys who have been watching the Springers since they can remember. They are always willing to help out the coaches, and the umpires make the right call. Ryan Lieser has been attending Cold Spring Springer games basically his entire life. He has been to the ballpark more than most people his age and loves everything the Cold Spring Springers offer. Ryan is a 2003 ROCORI High School grad and plays basketball for St. Johns University. He brings speed and agility to a powerful Cold Spring Springers lineup. In our latest feature of "Meet the Springers" we get a chance to meet another ROCORI High School grad. First baseman Darren Heying has been a member of the Cold Spring Springers for his 9th season and is off to another good start. Darren is the starting 1st baseman for the club and also plays a little bit at third base when needed. He is a great team player and stresses the importance of setting goals each year. We had a chance to get up close and personal with one of the self-proclaimed "old guys" of the Cold Springer Springers. Outfielder Ben Griffin has been a part of the team since 1992 and has loved every moment of it. He is the starting right fielder and one of the bats the Springers rely on come playoff time. Zach Reif is another ROCORI High School grad from 2003. He has been a member of the ROCORI Springers for his fifth summer now and is one of the key relief pitchers that they rely on. Zach Reif is a joker and a prankster but has the ability to flip the switch and get his game face on. Zach Reif talks about how fun it is to play in front of his friends and family. Its another segment of Meet the Springers. This time we introduce you to an Austin, MN native. Andy Bulson has been with the Springer squad for just under a decade is one of the team's ace pitchers. He also carries his weight at the plate. Andy has had a breakout season with the bat this year. Andy is a father of two and tells us how much fun it is to have them be a part of the game. Mike Burtzel is a familiar face in the ROCORI community. He has been playing sports his entire life with his brothers and sister. Mike is a 2003 ROCORI high school grad and was recruited by the Cold Spring Springers right out of high school. He is the Cold Spring Springers starting second baseman and leadoff hitter. In our second part of the Meet the Springers segments we interview ROCORI great, shortstop Steve Huls. Steve was drafted by the Minnesota Twins in the 15th round and played minor league ball for five and a half years. He has a special place for "Springer ball" and the Cold Spring Springers. The 2007 Cold Spring Springers' season is now under way and one of the key pieces to their potential success lies with starting pitcher Zach Femrite. Zach, a ROCORI High School graduate, has been playing ball ever since he can remember and is now in his 10th year with the Springers. 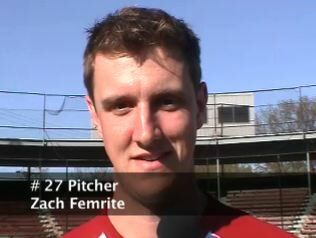 Femrite describes hiimself as a "late bloomer" and feels he has yet to reach his peak as a 90 mile an hour plus pitcher. This is the first of many in-depth and up close interviews you'll be able to enjoy this year here on DigElogROCORI. Our goal is to bring you closer to the excitement and action of Springers baseball.